The death of former World Chess Champion Bobby Fischer last week in Iceland, brought back a range of emotions and memories of how I began my love of chess. Fischer’s meteoric rise captured my imagination and those of my fellow school chums when he played for the title in 1972. Listening to New York commentators like Shelby Lyman, Jimmy Sherwin and Edmar Mednis on the fledging PBS television network; Dispatches from the NY Times columnist Robert Byrne; Kissinger and Nixon pleading with Fischer to continue the match after going down 0-2 and culminating with his eventual victory over the Soviet champion Boris Spassky. The excitement we felt seeing NY mayor John Lindsay bestowing the keys to the city on Fischer was a joy to behold; even the Russians grudgingly applauded him… And then he was gone. Fischer’s mysterious disappearance was followed by the inevitable default of his title to the young Anatoly Karpov in 1975 and a myriad of bizarre sightings; An arrest for vagrancy once landed him in a Pasedena jail; He defeated MIT’s Greenblatt computer chess program in 1978; Suddenly surfacing in a parking lot during the final rounds of a U.S. Chess Championship, to the shock of all; Charges of tax evasion and the subsequent State Department sanctions for playing a rematch with Spassky in war-torn Yugoslavia. These tales and many more have been well documented, yet it was his brand of chess, a captivating, attacking, neo-classical, take-no-prisoner approach that gripped and fascinated the entire world and one hopes, how he will best be remembered. In the years that followed Fischer’s victory, chess in the U.S. blossomed and my interest was no different. My good friend and future chess master Vincent Moore ran a local chess shop in Washington D.C.’s Georgetown. I served as a punching bag for most of the players there, until the drubbings finally sunk in and I began to understand why I was losing. Undaunted, I took it upon myself to study and memorize Fischer’s seminal book, “My 60 Memorable Games”. Clearly one of the best chess books ever written, reading it was almost like Bobby himself was talking to me. On taking on the fearsome Dragon variation of the Sicilian Defense, Bobby wrote, “Pry open the kingside, then sac, sac, sac!” For those of us who have played against it, he spoke volumes with that phase and gave Dragon players reason to cringe. His records were truly unbelievable: At 14, the youngest Grandmaster ever at the time, youngest U.S. Champion at 15, ripping through the tournaments and Candidate/World Championship qualifying matches virtually undefeated and the list goes on. I was hooked. In 1979 while attending the Corcoran School of Art, I would often play on the chess tables at Dupont Circle and in front of the White House in Lafayette Square Park. So much so that my professor, fearing my grades would suffer, instructed me to do a paper on Marcel Duchamp, where I learned that he was not only an incredible artist, but a chess fanatic and captain of the French Olympic Chess team in 1933, drawing U.S. champion Frank Marshall. Duchamp would continue to play in South America, designing chess stamps and modern chess pieces with friends Max Ernst and Man Ray. With Fischer all but vanished, the chess boom nevertheless continued in the U.S. and I discovered the brave new world of chess books. Sadly my progress was slow to say the least. Moving to New York City however, certainly helped. A few chess lessons and spending countless hours on the famed chess tables at NYU’s Washington Square Park certainly was inspiring. These were the very same tables on which Bobby himself had cut his teeth and today, many of NYC’s chess greats can still be seen there. Eventually I would use what I learned from studying Fischer in tournaments, playing for Brown University’s 1983 championship chess team, winning a few thousand dollars in New York, Maryland, Boston and Rhode Island, (even beating a few masters along the way!) Alas, there is always someone a little stronger to knock you down just when you think you’ve got it figured out! 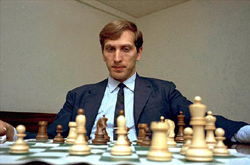 Now Bobby Fischer is gone again, just as suddenly as he arrived and the controversy he generated will surely surround him for years to come. There are plenty of great books on Fischer, including local International Master and Mechanic Institute resident John Donaldson and Eric Tangborn’s “The Unknown Bobby Fischer” and wonderful films like “Searching for Bobby Fischer”, by San Francisco’s Steve Zallian. Recently however, Fischer’s sad and tragic outbursts will also plague him. From his anti-semetic diatribes and praise for the 9/11 attackers, to the sad interview with ESPN’s Jeremy Schapp; his arrest and detainment in Japan and finally his exile and death in Iceland, the scene of his greatest triumph. Most chess players will, I hope, remember him for his insightful, clear and uncompromising chess. For some reason, one game of Fischer’s has always left me in complete and utter awe. It’s not his workman like destruction of Denmark’s Bent Larson or his celebrated game against Donald Byrne, where he sacrificed his Queen at age 12 and spun a spectacular mating net, but rather his game against Byrne’s brother, the late NY Times chess columnist Robert Byrne during the 1963 U.S. Championship. I’ve never forgotten it and I present it below. It’s how I’ll best remember Bobby Fischer. E. “Doc” Smith is a former Rhode Island Amateur Champion, and has won divisional titles in the U.S. Amateur Team Championships for Brown University as well as the Rhode Island Chess League Championships. He has also taught chess to kids in S.F. schools, where he has directed several successful citywide tournaments.